We have been asked, as a parish, to contribute £9,000 towards the expected £75,000 build cost for a new chapel within the new Newman School. If you would like to make a donation towards the building cost, this can be made via cheque [‘Newman Chapel Fund’] or in cash. Please enclose in an envelope marked ‘Newman Chapel Fund’. Holy Mass will be offered regularly at Newman School for the intention of benefactors. We are grateful for a donation of £60 received last weekend. Please help the parish reach its total - small amounts are appreciated. The current parish contribution stands at £8,610 - can you contribute towards the remaining £390? From the beginning of Advent, we’ll no longer have the sheets with the prayers and readings at Mass: whilst they provide the readings each week, it is a wasteful and perhaps even disrespectful way to engage with the Sacred Scripture during Mass: the majority of sheets end up in landfill - is this how we should be treating the ‘Word of God’ printed on these pages? 172 were at Mass last weekend. Thank you for your offertory contribution of £744.13. A spectacular and dramatic outdoor performance portraying the betrayal, death and resurrection of Jesus Christ is being planned for Saturday 13 April 2019, i.e. the day before Palm Sunday, in Carlisle City centre. The participation of all the churches is invited and there are many ways in which to become involved. Visit the website www.carlislepassionplay.org; or e-mail the organisers, infor@carlislepassionplay.org. 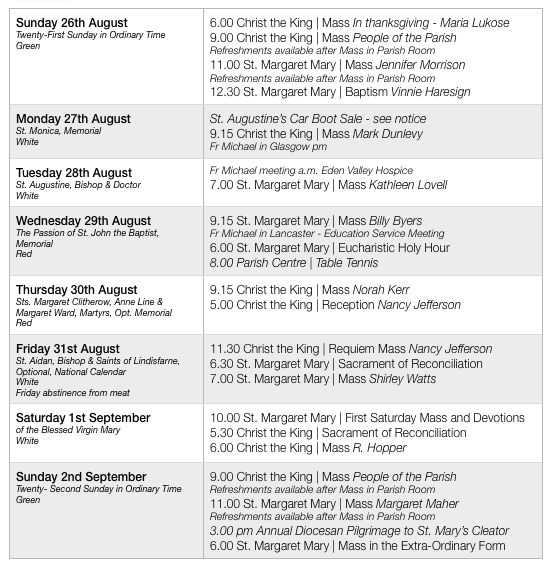 Everyone, especially those who are ill, are invited to take part in our diocesan pilgrimage to the shrine of Our Lady at Cleatoron Sunday 2 September. Mass and blessing of the sick, - 3.00pm. The Bishop will preside and preach. See the poster. Unfortunately we are unable to organise a coach and meal this year and regretfully cancel the notices of previous weeks - sorry for any inconvenience this may cause. Parishioners are free to attend under their own steam. St Augustine’s is holding its Car Boot Sale on Monday 27th August. Cars £5.00, Cars with Trailers or Vans £8.00 Sellers are available to enter the site from 7.00 am. Admittance 20p. As you’ve probably seen in the media, terrible floods have been taking place in Kerala in southern India. Hundreds of people have been killed and many more are missing; countless homes have been washed away, and the monsoon season is set to continue until early September. Kerala is the most Christian state in India – it has more churches than any other region. The leading Catholic volunteering charity, the St Vincent de Paul Society (SVP), is very active there and they are doing great work helping the victims of the flood in local communities. However, they desperately need funds. Please contribute to the SVP’s Kerala appeal. To donate visit www.svp.org.uk, telephone 020 7703 3030 or send cheques made out to SVP (write ‘Kerala appeal’ on the back) to SVP, Romero House, 55 Westminster Bridge Road, London SE1 7JB. And please remember our sisters and brothers in Kerala in your prayers. The Holy Father, Pope Francis, has written a letter To the People of God concerning scandals currently being experienced in America concerning historic sexual abuse. The letter can be found at http://w2.vatican.va/content/francesco/en/letters/2018/documents/papa-francesco_20180820_lettera-popolo-didio.html. A printed version is available in both churches. We have been asked, as a parish, to contribute £9,000 towards the expected £75,000 build cost for a new chapel within the new Newman School. If you would like to make a donation towards the building cost, this can be made via cheque [‘Newman Chapel Fund’] or in cash. Please enclose in an envelope marked ‘Newman Chapel Fund’. Holy Mass will be offered regularly at Newman School for the intention of benefactors. Please help the parish reach its total - small amounts are appreciated. The current parish contribution stands at £8,550 - can you contribute towards the remaining £450? The parish is willing to order, from the Catholic Truth Society, two Missals for parishioners. An ‘Annual Missal’ in paperback which is £5, or a full three-year Missal, which the parish will subsidise - it is hardbound and will cost £15. If you would like to order one, please register your interest on forms available in both churches. Examples of the two Missals are also there. 169 were at Mass last weekend [a new low]. Thank you for your offertory contribution of £595.40. Last week, the contract to build the new Newman School was awarded to a firm called Galliford Try. They are looking to submit a planning application as soon as possible. With this in mind, there will be public consultations taking place on Thursday 23rd August – 10.00 am – 12.00 pm in the school (Pennine Way site) and 4.00 pm – 7.00 pm at St Margaret Mary Parish Centre. You are very welcome to attend the “drop in” consultations and see the proposal for the new school. A spectacular and dramatic outdoor performance portraying the betrayal, death and resurrection of Jesus Christ is being planned for Saturday 13 April 2019, i.e. the day before Palm Sunday, in Carlisle City centre. The participation of all the churches is invited and there are many ways in which to become involved. Visit the website www.carlislepassionplay.org; or e-mail the organisers at infor@carlislepassionplay.org. Thanks to all who attended the recent Cream Tea event in the New Waterton Hall. The afternoon was a great success, both socially and financially. The amount raised was in excess of £600. We value your ongoing support. 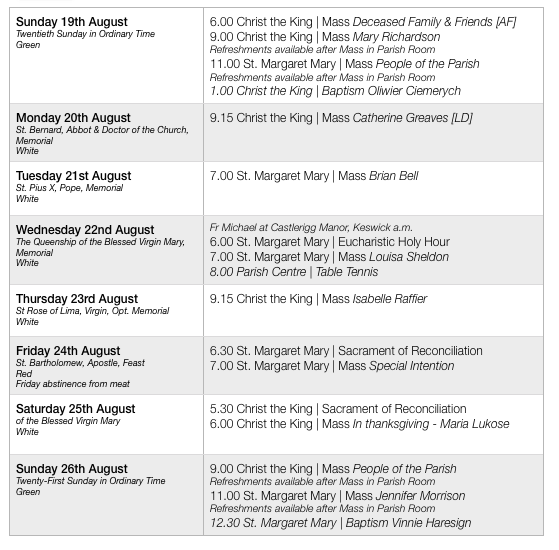 Everyone, especially those who are ill, is invited to take part in our diocesan pilgrimage to the shrine of Our Lady at Cleator on Sunday 2 September. Mass and blessing of the sick will be held at 3.00 pm. The Bishop will preside and preach. See the poster. Tea and coffee will be available before and after the pilgrimage in the parish room. For further details, contact St Mary’s Priory, Cleator on 01946 810324 or email stmandstj@gmail.com. Last year we attended this pilgrimage as a parish with a lovely meal on the way home - if you are interested in joining a similar trip this year, please sign up on sheets. St Augustine’s is holding its Car Boot Sale on Monday 27th August. Cars £5.00, Cars with Trailers or Vans £8.00. Sellers are able to enter the site from 7.00 am. Admittance 20p. The Diocese recently paid into the Parish Account the Gift Aid return for those parishioners in the scheme who attend Christ the King. £6,334.32 was the amount. If you are a UK tax payer, it is an ideal way to contribute a little extra to the parish with no further cost to yourself. Please see Fr Michael for more information. Please note the time of Mass on Wednesday - Fr Michael is in Keswick in the morning doing a session on ‘Prayer’ for the new team there.